Every Friday of every month, Teleperformance organise that all the employees within each campaign over the entire company wear their own casual clothes to work all in aid of a selected charity of that month. Teleperformance chose PIPS Newry & Mourne for their selected charity for the month of September, which meant that all the money donated by employees each Friday was given to our charity. Something so simple yet it makes a big difference to PIPS Newry and Mourne and really means a lot to our charity. Teleperformance would like to thank all the employees for their continued effort over each month. Likewise, PIPS N&M would like to thanks Teleperformance for choosing us as a selected charity and for their consistent charity work for not only PIPS N&M but local charities in the area also. The staff also deserves a special thanks for participating and taking the time to donate, as without them there would be no donation. Well done to everyone who participated and continue to support a charity every Friday. Thank-you. 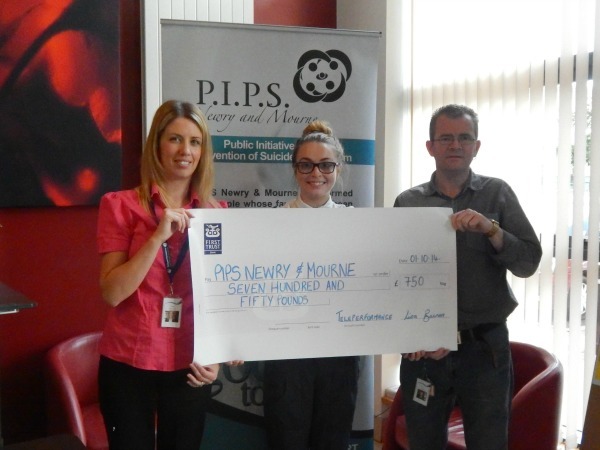 Pictured below is staff members Lisa Bannon and Kevin Magee presenting a cheque for £750 to PIPS N&M Amy Henshaw.